The common bug that can cut your life expectancy by 20 years. 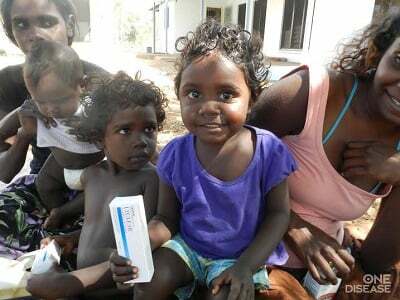 Healthy children and mothers from Arnhem Land know how to remain free from scabies to live a healthy life. That grabbed your attention, didn’t it? Now what if I told you that if you’re not Indigenous, then you probably don’t have to be concerned. I expect, like me, you will find this outrageous in a modern, developed country like Australia. For a nation which calls itself the “Lucky Country”, it’s little secret that life is far from lucky for our Indigenous Australians, who can expect to live between 10-20 years less than other Australians. What very few of us know, is that one contributor to this enormous life expectancy gap is a microscopic skin-burrowing mite that can be treated with a $16 topical cream. The Sarcoptes scabiei mite causes a disease colloquially known as scabies, a highly contagious, neglected tropical disease which is commonly found in developing countries such as Panama, Papua New Guinea and throughout Africa. The World Health Organisation predicts as many as 130 million people are affected by scabies at any time, with the highest rates occurring in countries with tropical climates where overcrowding and poverty coexist. It is a sorry state of affairs for our developed nation that we fall into such a category. In a country where mozzie and insect bites are a part of Australian life, you can be forgiven for writing off scabies as a pesky inconvenience. What presents as an innocent itch, can quickly turn into a nasty infection, and if left untreated, can lead to serious flow-on conditions such as kidney failure and rheumatic heart disease – rates of which in the Top End of Australia are amongst the highest in the world. 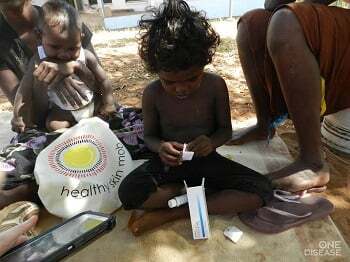 As many as 7 in 10 Indigenous children living in remote areas of Australia will suffer from scabies at least once before their first birthday – with regular, uncomfortably reoccurrences a common part of childhood. The excruciating itch caused from the mite can require children to receive sedatives to help them sleep at night, painful antibiotic injections for infected scabies sores, and can affect school attendance. Julia Galliers, a registered paediatric nurse based out of Darwin knows the serious side of scabies all too well; “we’ve got Indigenous kids as young as nine being air lifted out of remote communities needing heart valve replacements, and just last week we had a 12 year old lifted out with acute kidney disease, it was no surprise to see the poor little guy was also covered in scabies sores. We’ve got to put a stop to this bug”. And stop it she will. Julia recently joined One Disease, an Australian medical not-for- profit who is leading the way globally to eliminate this disease. But you don’t need to have a medical qualification like Julia to also join in the fight against scabies. This September, One Disease are asking Australians to give up just one night out, and spend One Night In instead. What you or I wouldn’t blink at spending on a normal night out –parking, dinner, a few drinks, the price of a movie ticket, can create a lasting impact on the health of our Indigenous Australians. Taking part is simple, either donate what you’d spend on a typical night out via the One Disease website, or go one better and ask your friends to join you for One Night In at your house. Spending One Night In doesn’t mean you and your friends can’t have fun, why not invite them over for a movie night, pot luck dinner, or even to watch the footy finals. Uber Australia is generously taking care of transport for the night, proving $25 towards the journey to a One Night In event – making it easier for your guests to donate more. Closing the gap on Indigenous disadvantage can seem overwhelming. We are shining the light on a little known issue in the hope that Australians will get behind it, because together we can achieve lasting results. No Australian should die from a preventable disease. One Night In for One Disease donations can be made online here. To register to host your own One Night In or to find resources to help you plan your event head to here. 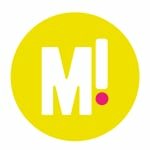 For more information about One Disease please visit their website here.